I’ve been tardy in posting photo’s of weapons I’ve written about, but I’ve been so busy at work and home that it’s not allowing me to write, photo and document as much as I’d like to so I apologize for that. 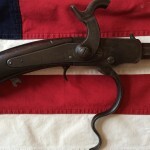 The next weapon in the Civil War Arsenal that I’ll be writing about is the 1864 Type II Gwyn and Campbell Carbine. 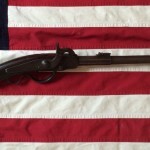 One of the more interesting looking weapons of the Civil War. There were actually 3 versions of this carbine. The first was the 1862 Cosmopolitan of which 1140 carbines were manufactured, next was the 1863 Gwyn and Campbell Type I, 4200 of these carbines were manufactured and finally the 1864 Type II Gwyn and Campbell of which 4002 carbines were manufactured. A total of 9342 carbines were purchase by the Ordnance Dept. for the sum of $197,320.00 as well as 6,300,000 linen cartridges for $132,007.27. The Cosmopolitan (Gwyn and Campbell) gets its name from the manufacturer, Cosmopolitan Arms Company of Hamilton, Ohio. 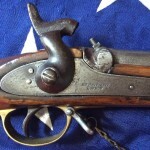 It is also known as the ‘’Gwyn and Campbell” for the owners of the Cosmopolitan Arms Co. “Grapevine” because of the snake like curves in the trigger guard lever and long hammer; “Union Rifle” for the markings on the frame; “Ohio” for the state in which it was manufactured; and “Gross” for the inventor. 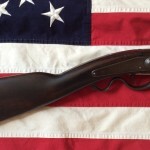 The inventor, Henry Gross received U.S. Patent #25,259 on August 30, 1859 for the Cosmopolitan carbine. 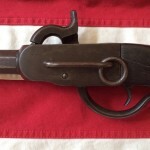 In 1860 the carbine was tested by Erskine Allin, the Master Armourer at the Springfield Armory, and again on June 9, 1860 by the Navy at the Naval Yard Washington with overall success. 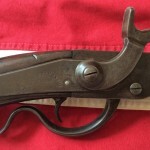 The actual manufacturing of the carbine was in Hamilton, Butler County, Ohio at the Cosmopolitan Arms Company which had been established in 1860. The firm’s owners were Edward Gwyn and Abner C. Campbell. 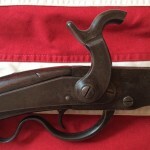 The first wartime order for the Cosmopolitan carbine was requested by Illinois Governor Richard Yates through his State Quartermaster General’s headquarters at Springfield, Ill. Quartermaster General John Wood in a letter to Major Hagner dated December 12, 1861, requisitioned the Cosmopolitan Carbines for the Governor’s Legion. This letter introduced Edward Gwyn to Major Hagner so that Gwyn could obtain the order to furnish the Cosmopolitan for the Governors troops. Major Hagner in turn contacted General Ripley asking approval to give the order to Mr. Gwyn for 1,140 carbines plus appendages at $27.00 each with delivery in 60 days. 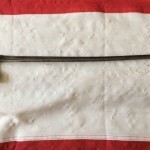 The linen cartridge used a .52 caliber bullet weighting 390 grains and using 40 grains of powder, the overall length of the cartridge was 1.63 inches. The overall length of the carbine was 39 inches and it weighed 6 pounds 9 ounces. It does not have a fore stock and all carbines are marked UNION/RIFLE on the right side of the frame. The 19 inch blue barrel has a 3 ½ inch octagon section at the breech; with an iron blade front sight and a folding leaf rear sight graduated to 900 yards (type II versions have a 600 yard graduated rear sight). All major parts are serial numbered and also have an assembly number. The delivery on December 31, 1864 closed out the Gwyn and Campbell contracts during the Civil War. Many Calvary Regiments were issued the Gwyn and Campbell with a few being the 2nd and 3rd Arkansas; 5th, 6th and 16th Illinois; 3rd and 4th Indiana’s; 4th and 8th Iowa; 2nd, 6th and 14th Kansas; 10th, 12th, 14th and 40th Kentucky; 4th and 8th Missouri; 5th and 8th Ohio; 7th Tennessee; and the 3rd Wisconsin. 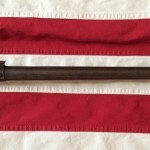 In response to the 1863-1864 Ordnance Dept. survey of officers in the field using the various carbines, 37 officers commented on the Cosmopolitan with 23 considering it fully satisfactory and 14 considering it worthless. 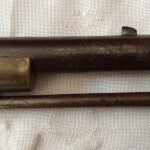 The major problem was found to be in the action of the breech mechanism. So that brings me to my 1864 Gwyn and Campbell Type II, which is in good condition. It does have a repair to the stock which is hardly noticeable, aside from that everything else is fine. The bluing on the barrel has worn off over the years but that just adds to the character of the weapon. All of the markings are legible and the action is perfect. 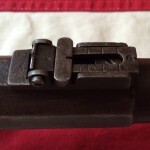 The rear sight is the 600 yard graduated style and it has a sling ring on the left side. The serial # is in the 3500 range and the assembly number is 42. I’d like to thank John D. McAulay for all the great research he’s done. Without his book “Carbines of the Civil War” I would not be able to write this article in such detail. 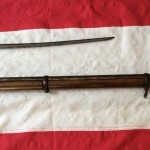 Over the last week or so I’ve been struggling with what I was going to write about this week, then I remembered that Greg posted a comment on my article about the 1862 Enfield SH&G #3 Musket, so I thought what better time to write about yet another weapon in my Civil War Arsenal. 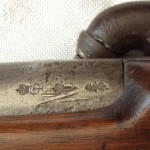 The R.T. Pritchett Enfield Rifle Musket, Sinclair & Hamilton Company, (Crown/ SH/C/ Arrow). I think this mark is referred to as Type #2. 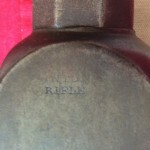 The mark is on the bottom of the stock close to the trigger guard. The mark is faint but under the right light it is clearly there. 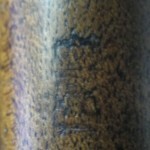 I will be using the macro setting on my camera to photo the mark I hope it is clear enough to be seen. Pritchett was a well known contractor who supplied many Enfield Rifle Muskets and parts to Confederate brokerage houses. Two of the more famous ones were S. Isaac & Campbell and Sinclair, Hamilton & Company. Pritchett the inventor of the improved bullet for the 1853 Enfield, firing one of his own rifles on a windy, rainy day, shot 98 out of 100 shots in a 7 foot circle at 600 yards. Pretty good shooting especially at that range. Aside from inventing and building guns Pritchett was also a business man who like so many others took advantage of the financial opportunities the American Civil War had to offer. Another one of those opportunists were Archibald Hamilton. 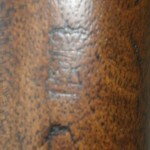 Archibald was the Director of the London Armoury Company; they were a major gun making company in London. 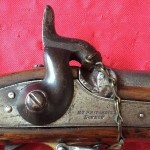 The quality of the London Armoury Guns was superior to other London Contractors since the L.A.CO’s parts were interchangeable and the others were not. Archibald was a major player in the English arms industry, Director of the L.A.Co and was partners in a brokerage firm, this would create the perfect storm for the Confederacy to purchase, ship and receive the much needed weapons. It wasn’t long before the South became the London Armoury Company’s principal client and it manufactured and shipped more than 70,000 rifles and about 7,000 revolvers (out of a total production run of about 10,000) to the South. However these weapons had to pass through the Union blockades and the number that actually reached the Confederate army is unknown. Confederates acclaimed the Armoury’s guns as the best weapons made in Britain. Towards the end of the war the London Armoury Company was almost completely dependent on sales to the Confederacy and survived for only a year after the end of the war, dissolving in the Spring of 1866. 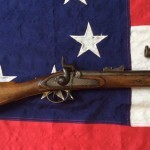 So back to the Pritchett Rifle Musket, this gun is in fair condition with a wonderful mocha color stock. 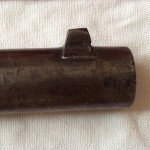 The barrel and hardware have a brownish color throughout but no rust. 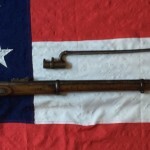 This is one of the first Civil War guns I purchased and I probably paid a little more then I should have but all and all it’s a very nice example of a Confederate Import with the crown/ SH/C/arrow mark.